Hello everyone! Today I am featuring a middle eastern inspired dish. I am sure everyone must have had shawarma's in one form or the other - either from the roadside stall or at a dhabba/restaurant or even at weddings. I wanted to try making one at home to experiment with flavors and adust as required for the next time :). I also came across this wonderful recipe online and it just called out to 'make me' - made a few adjustments from this other gyro recipe (obviously) that I came across and well, here is an absolutely fantastic Sunday night dinner. 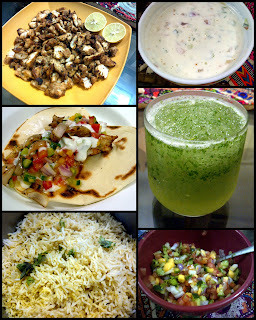 This time, I had decided to do an entire meal so made the Halal Food Cart style spiced rice (on request from my little brother) and icy cold Shikanjabeen (lemon and mint drink) as well which was so refreshing in this hot weather. For those of who are you who are looking for the recipe for the Shikanjabeen, will post that in a few days along with a really simple recipe for Pina Colada - absolutely a breeze to make and requires just a few basic ingredients and a blender. Combine the spice mix with the yogurt, lemon juice, garlic, vinegar and salt in a large bowl. Add the chicken and toss to coat. Cover and refrigerate 2 to 24 hours. Heat a grill pan (a skillet can be used if a grill pan is not available) with about 1 tbsp of oil. Sprinkle about 1 teaspoon of brown sugar and a dash of hot sauce (2 to 3 drops) then add the chicken. Make sure that the chicken pieces do not overlap one another. Cook till one side is golden brown making sure the chicken does not burn. Sprinkle a little bit of brown sugar and hot sauce on the top of the chicken then grill on the other side. If required, cook the chicken in two batches, sprinkling brown sugar and hot sauce as required. Add oil as required when cooking the chicken on the other side and in two batches - about 4 tbsp of oil should be required if cooking the chicken in two batches. 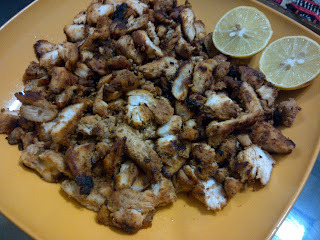 Remove the chicken from the pan and then transfer it to a cutting board - slice the chicken into thin pieces. Transfer the chicken back to the grill pan, and cook for 1-2 minutes enough to just heat through the chicken again. For caramelized onions, just add the onions to the pan and cook for a few minutes till golden brown - the remaining brown bits to the pan will give flavor to the onions - in case the grill pan has become too black, clean with a paper towel otherwise the chicken and the onions will turn black. Note: The brown sugar is added to add in the caramelization of the chicken and to give a lovely brown color - it will also give a subtle sweet flavor to the chicken which is really tasty in the dish, however, in case you don't like the flavor, then brown sugar can be reduced or not even added altogether - the grill pan will still give a good char on the chicken. Please be careful while re-heating the chicken - I left it for a few minutes and the chicken turned just slightly dark - it tasted great but it lost the beautiful golden brown color from the grill pan and the brown sugar. Note: I didn't do this, because well, I couldn't strain my strainer and that's why my sauce is more like a thick Raita than a dip which is what is required. Method Put the finely chopped cucumber in a colander and sprinkle salt on top. Let this sit for an hour with a plate below it in the fridge so that the water from the cucumber is is reduced. Add the cucumber along with crushed & chopped garlic to the yoghurt. Add lemon juice and mix it all up. Taste and adjust as required. Mix all the vegetables together. Add vinegar and salt and mix well. Serve. Adjust the ingredietns in the salsa as per your liking, I had fresh mango at home so I decided to add some for a sweet flavor and I also increased the ratio of tomatoes because I love tomatoes. 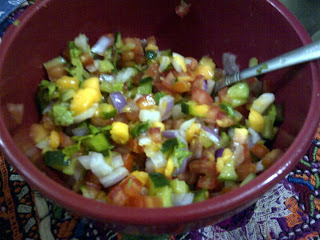 Alternatively, you could use corn, pineapple, avacodo, jalepeno's depending on what is available. 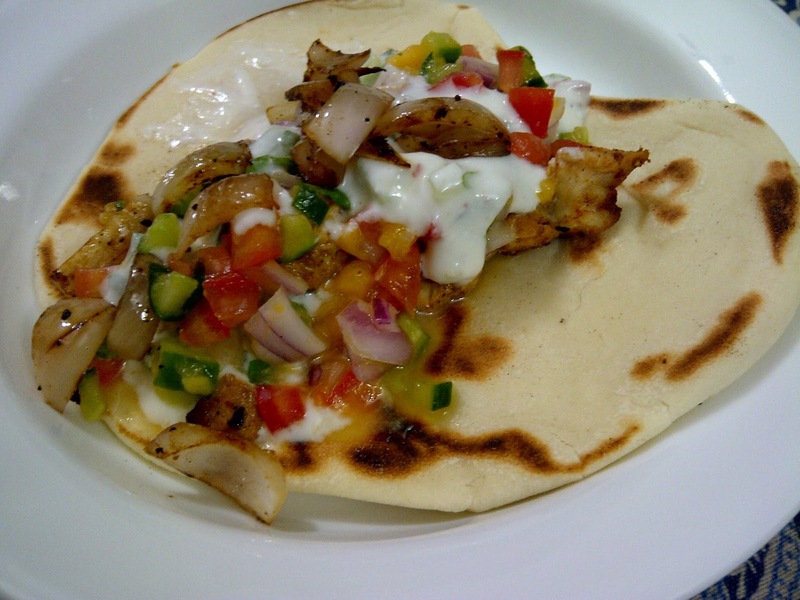 Take the lightly toasted pita bread, add chicken, tzatziki sauce & salsa. Add caramelized onions on top. Roll it up and eat :). 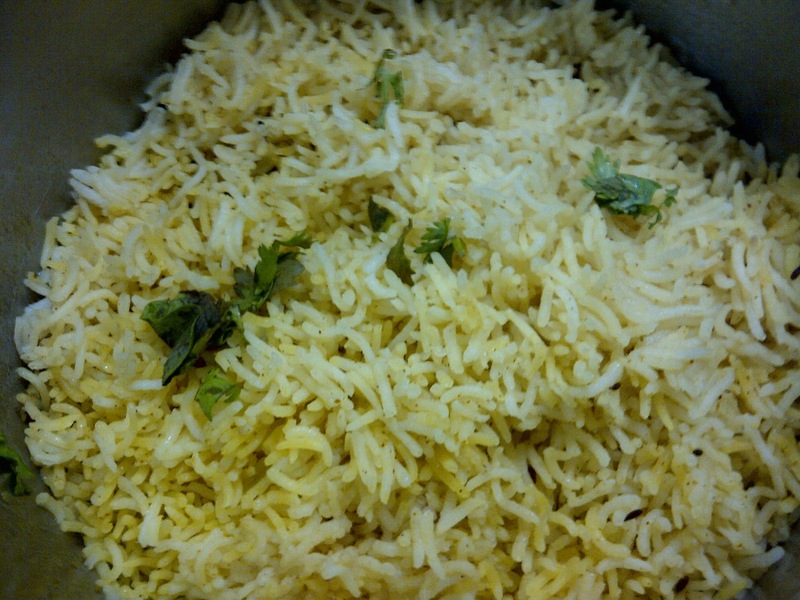 I also served spiced rice on the side - the one that I had made earlier with the Halal Chicken with Rice. ground fenugreek is kasoori methi? Also, could you put up a pita bread recipe? one made on skillet preferably. Hi, yes it is .. need to put up a detailed glossary as well. I usually get the Pita Breads from Pie in the Sky but will try some out for you!